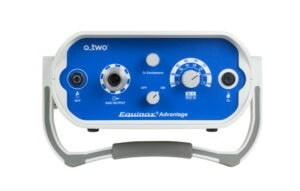 The O-Two Equinox® Advantage Oxygen/Nitrous Oxide Mixing and Delivery System allows you to control the mix of gas and oxygen a patient is receiving in order to provide the appropriate dose for the patient and the procedure. Designed for use everywhere from the pre-hospital (ambulance), in-hospital (ER, Labor and Delivery etc.) and Dental (Surgical Procedures), the portable Equinox® Advantage system is easy to use, and eliminates the risk of delivering a hypoxic mixture. The O-Two Equinox® Advantage consists of a dual gas (Oxygen and Nitrous Oxide) control module mixing system that maintains the output gas mixture at a constant ratio, over 8 settings, from 25% to 100% oxygen. Each of the two inputs have gas specific built-in alarm systems that generate both visual and audible alarms should either the nitrous oxide or oxygen input fall below 40 PSI. There is also a built-in oxygen fail-safe that will provide 100% oxygen should the nitrous oxide input fall below 35 PSI. The system has one Rotary Control Knob for turning the unit to the ON or OFF position and one Rotary Control knob for the selection of the Oxygen/Nitrous Oxide mixture. When the unit is turned ON, the output of the O2/N2O gas mixture will only be activated by an inspiratory effort by the patient. The internal demand valve delivers high flow rates with low triggering pressures, reducing the amount of effort required by the patient to maintain the demanded flow. The exhaled gas scavenging port allows the attachment of a scavenging hose to help scavenge exhaled gas away from the patient environment. The Oxygen Enrichment feature on the O-Two Equinox® Advantage allows the Operator to provide up to 20 L/min of 100% Oxygen through the Patient Circuit by depressing the O2 Enrichment Button. mixtures for trauma, childbirth or other painful procedures.